With England fans preparing with Amsterdam’s police force for their inevitable losses to Russian hooligans at the World Cup, England also began their warm-up for the summer on the pitch. Gareth Southgate set out his team in a 3-5-2 shape, with Kyle Walker playing as an outside centre-back in the back three and while Ronald Koeman lined up his team in a 3-4-3 formation for his first match in charge. Firstly it’s probably important to state out the blocks that the Dutch didn’t really offer anything in this game, so it will mostly be about England. Without a tournament on the horizon, they had nothing to play for and arguably more to lose by trying, as they will soon be returning to their clubs having played two pointless games. Their passing was slow, with most players taking two touches before moving the ball on, meaning it was never difficult for England to get into position. The closest thing they had to any real attacking strategy was just frequently passing it to Memphis Depay, who just cut inside into a crowded centre. As a result, the game was essentially a training game of whether or not England could break down a packed defence. The Dutch started the game pressing high up the pitch on a man-to-man basis, with each of their front three pushing up close to England’s back three. 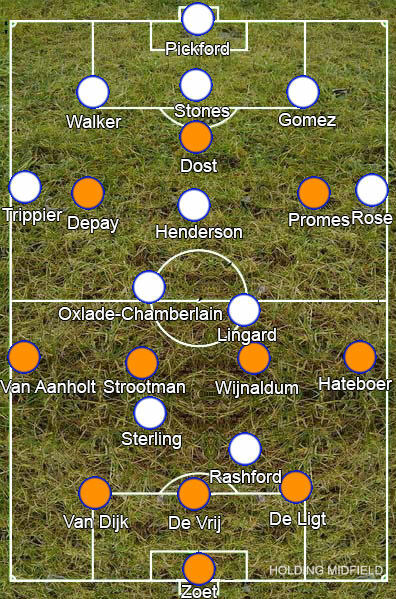 It didn’t really work however as Jordan Henderson would simply drop back close to them, so England outnumbered the Dutch in this area four to three, with Kevin Strootman caught between following Henderson so he couldn’t turn and not wanting to leaving a gaping hole between the midfield and defence. With England’s backline retreating even deeper, often along the goalline, in the build-up to make the pitch bigger, Kieran Trippier also pulled back deeper and this opened up space in front of him for Alex Oxlade-Chamberlain to pull wide and act as an easy outball on the right touchline. This left the Dutch pressing completely ineffective and they soon gave up in favour of sitting back and forcing the English to play through them. Much like the Dutch, England targeted most of their attacks down the left flank. Jesse Lingard was the midfielder given most freedom to get forward, which made sense given his game is mostly about knitting together quick one-two passes, so he would push up between the lines and combine with Raheem Sterling in the centre and Danny Rose down the outside, making quick passes amongst themselves to try to break through and release Marcus Rashford. Sometimes Rashford would drop back while Sterling would push forward to lead the line, but it worked a lot better when Rashford acted as the number nine – he’s at his best when the ball is played ahead of him, using his pace and finishing to scare the backline, rather than having to operate in tight spaces, whereas Sterling is probably England’s most talented player in this area. Nevertheless they didn’t really create much. With five defenders back, the Dutch defence had plenty of cover, so Rose, Lingard and Sterling didn’t have much space to work in. England really needed to stretch the Dutch backline if they were going to break them down, but having Trippier on the right really limited them. The wing-back’s lack of pace means he’s not very comfortable getting very high up the pitch and attacking down the outside. You could often see him pointing forward when he was on the ball on the right, clearly wanting someone to overlap into the space behind the Dutch wing-back rather than attacking it himself, however, as Lingard was pushing up on the left, Oxlade-Chamberlain had to stay back deeper to cover the midfield with Henderson. Walker was presumably chosen to be in the back three ability with his feet, but this seemed a bit of a waste of his athleticism – there was one instance early on where he drove forward into the opposition half, but that was it. Walker could have easily got up and down the pitch on the right side, but passing to Trippier always ended up as a dead-end for England, which was particularly frustrating as Depay made little attempt to track back. Henderson’s passing also didn’t help. He’s happy hitting long cross-field balls out to the wing-backs, however he generally avoids passes through the centre into the midfield. These are quite dangerous if they go wrong, as if he misplaces them the opposition can immediately get at him and the backline, but his aversion to them makes it difficult for England to build up from the back. He’s the first ball out of the defence for the back three, but most of the time he will just pass it straight back to them rather than moving it forward. England looked at their most dangerous when counter-attacking. Rather than press, they would drop back into a 5-3-2 shape and allow the Dutch to come forward, then when the Netherlands’ plodding passing inevitably gave it back to them they would quickly burst forward. Oxlade-Chamberlain’s passing from deep was useful at releasing the attackers, then the pace of Rashford, Sterling and Rose bombing on down the left would immediately put the Dutch defence on the back foot. England did finally get a goal shortly into the second half, but as the Dutch were hardly making any effort to stop it, there’s few conclusions to be drawn, which really highlights the problems with these kinds of friendlies. England’s uncertain backline is their glaring issue and they had no problems here, but the Dutch weren’t even trying to test them. Playing three of them might make up for some of their defensive failings as they will have more cover and it would also help the build-up as they are all good with their feet, so the system does look workable however we simply can’t know at this stage. Who will be in the PFA Team of the Year? Without Kane in the squad there was always going to be a bit of a experiment. I completely agree with your assessment of Henderson. I can’t help but thing that with a different player in there (e.g. Wilshire or even peak form Barkley) the team could transition into attack much quicker and play more vertical passes, as you mentioned. Yeah, if Winks could get more game time he’d probably be the best fit going forward, although Henderson is maybe the only one up to it defensively at the moment. I think England looks better in a 3-4-3, but can see why SG experimented with Kane missing. There isn’t really a natural replacement for the No 9 position, so it made sense to have two pacey wide forwards share the role instead. But for the WC, presuming Kane is fit, I think it would make sense to play him with Sterling and Ali. Rashford played well, but I think he would work better as an impact sub for England rather than starting straight away. Ali gives a better link between the midfield and attack, he could be crucial in break down deep defenses with his clever passes. I agree with Henderson worries. He needs a partner that can bring the ball forward alongside him, in a double pivot. Him as the sole holding player would not offer enough protection to the back line and he looks troubled when pressed. That’s why I think Delph should be given a chance alongside him. He is having a good season with City, could help cover Rose down the left and offer quick feet in deep positions. The back 3 still has question marks too. I was very surprised to see Cahill dropped completely, despite his lack of matches recently. He is the most experience CB we have and won the league playing on the left of a back 3 last season. I think we will likely see Dier drop back into the back 3 with Stones, but the other slot is completely open. Maguire is a talented CB but can he handle the pressure of the WC? Would Phil Jones be injury free and able to play games in short succession? Walker is probably our second most important player after Kane, he performed excellently in the back 3, but England surely needs him higher up the pitch to offer attacking thrust. Lots of questions still unanswered. Netherlands didn’t really test England at all.